This year will be the tenth generation of iPhone, yet all rumors still point to the introduction of iPhone 7 in September. This seems like a huge missed opportunity. Apple's tick tock cadence in introducing a new physical form factor every two years--with the year in-between focusing on internal advancements--is no longer necessary. Apple doesn't need to dramatically change the physical shape of iPhones every set number of years, any more than it needs to make regular, arbitrary physical changes to the iMac or MacBook just to keep customers interested. Today's form factor might be ideal to stick with for longer than in the past, and next year it is rumored to leap to a new form factor, which doesn't need to wait for a new two year window to be introduced. All the handwringing about whether this fall's iPhone will look much different is just more chatter among people who don't really get that the primary attraction to iPhones is how they work, not whether they look different enough from the previous year. Also, Apple is much larger than it was just five years ago and has more resources to quickly roll out new features and advances. Apple launched two sizes of iPhone over the last two years, along with a new model that reintroduced the previous 4 inch form factor. 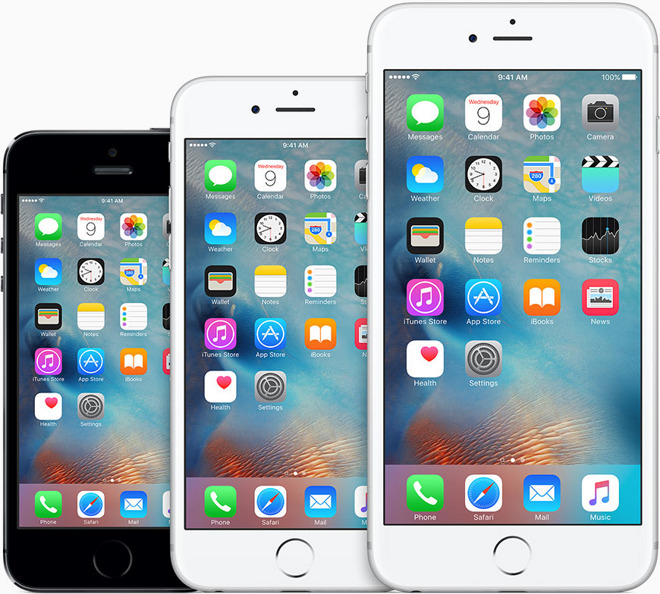 The company now sells a somewhat confusing array of devices (when approached as a non-technical customer): iPhone 6 models, the new iPhone 6s models, and a more recent, similarly specced but smaller sized iPhone SE. It would be ideal if Apple would sort things out by renaming its iPhone models by their actual generation number. That would make this fall's new models iPhone 10. The 6 and 6s models could be refreshed and relaunched as iPhone 8 and iPhone 9. And that other model could be officially lengthened out to iPhone SEven. That would give potential buyers a simpler set of options: iPhone Seven, 8, 9 or 10. They all would run the latest iOS 10. This year is the tenth year of iPhone, so it all makes sense and is clean going forward. Apple should drop the S cycle and even consider doing model refreshes throughout the year, rather than only having a single massive launch quarter once each winter. Apple could do an iPhone 10s in the spring, rather than a full year later. Much ink has been spilled about how great Google is at AI and how Apple is foolishly squandering its massive lead in profits by not having already delivered the ideas Google is talking about and demonstrating, among them the great wonderful value of surveillance based advertising to know what we want before we are even told what to do by our devices. One of the more thought-provoking ideas Google talked about at its IO conference last month was its development of custom silicon it calls the Tensor Processing Unit. In a blog posting, Google noted that this "TPU is tailored to machine learning applications, allowing the chip to be more tolerant of reduced computational precision, which means it requires fewer transistors per operation." If only Apple knew anything about designing custom silicon! Actually, while Google talks about its internal server-based approach to solving machine learning problems, Apple is getting ready to deliver its A10, the tenth major Application Processor chip (including iPad custom AxX versions) it has developed internally since entering the chip design business around 2009. Apple's Ax series of Application Processors are more than just an optimized set of CPU and GPU cores. Apple has built in a series of dedicated engines into its designs, including such things as specialized Audience earSmart noise cancelling logic for Siri voice recognition in the A5 used in iPhone 4s, which was later replaced with a proprietary in-house solution. 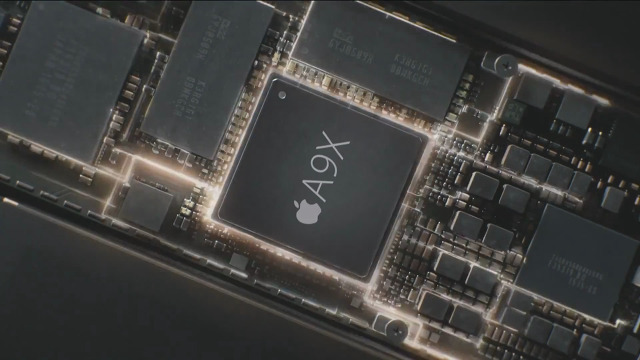 Apple's Ax chips also include hardware-accelerated encryption, which allows iPhones to perform full disk encryption much faster than Android devices can (which is why Android has turned off FDE by default, even on expensive high end phones). Apple also pioneers adoption of some of the the best video codecs for image compression and decompression, recently including support for H.265. The company has also increasingly directed attention to its advanced camera imaging logic, which helps iPhones capture better photos even when using the same sensors as its competitors. Another component Apple has profiled its is M motion coprocessor, which is now included in the main A9 package. This efficiently tracks data from motion sensors independently of the main processing cores, allowing the chip to keep working without burning as much power. There's still a lot about the Ax series designs that we don't know, with "we" even including the technical experts at Chipworks, who can take precise photos of the chip die but can't even guess what large areas of the silicon are doing. Apple now has extremely advanced silicon design expertise, and is building sophisticated new designs that it then mass produces with partners including Samsung and TSMC. If there are ways to advance the state of the art in encryption, video compression, voice recognition and AI intent calculation, it would be a bad bet to assume Apple is trailing the state of the art. While Google focused attention on AI processing cores for use in cloud server farms, Apple can incorporate these type of hardware technology right into their phone or other devices, enabling local computation that can work even when the network isn't available. Talk about a new iOS Dark Mode lit up when Apple released its dark WWDC app. But last year, Apple already introduced a dark mode for Macs for developers to start getting used to, making it quite obvious that there's an underlying reason why Apple is going dark. With OLED screens on the iPhone horizon within a year or two, Apple will want developers used to dark displays now. That's because rather than being a backlit image like LED, where a light shines through an unlit color image, OLED lights up each pixel. This means that the brighter the image being displayed, the more power is being used. Microsoft previously introduced Zune OLED devices that sought to save power by having a mostly black display. Dark UI is also already in play on Apple Watch, where the screen is predominantly black, because the display is OLED. When iPhones with OLED displays arrive, having a dark UI will help the system to conserve power better. There's also another apparent intent behind Dark Mode UI: when it arrives, it will be the cool new thing. In 2013, iOS 7 introduced a simplified, largely white interface for its products, even though Apple was clearly aware that in a few years it'd be moving to OLED. What better way to get users tired of white in the mean time? When Dark Mode apps begin to arrive later this year, they'll look refreshingly new. Just like wearable fashions, what's currently cool in computing is often tied to new technologies that enable new capabilities associated with a given appearance. In the late 70s, personal computers often only had green terminal screens due to limitations in phosphorescent CRTs. 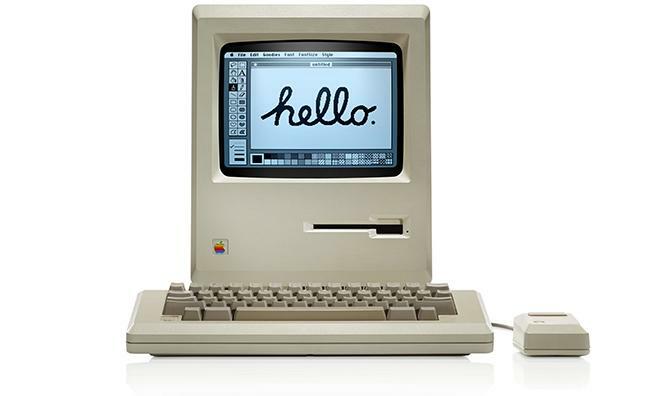 When Macs arrived in 1984 with more precise, square pixels that delivered a crisp, one-bit black and white display, the desktop appeared refreshingly light and white. Steve Jobs' NeXT Computer in 1988 used high quality four-bit greyscale displays, because high quality color wasn't very good or very affordable yet. The result was a darker overall UI that in the late 80s looked cool and new compared to the early-80s mostly-white Mac desktop. Apple refreshed its own offerings in the 1990s once 24-bit color graphics started to become affordable. 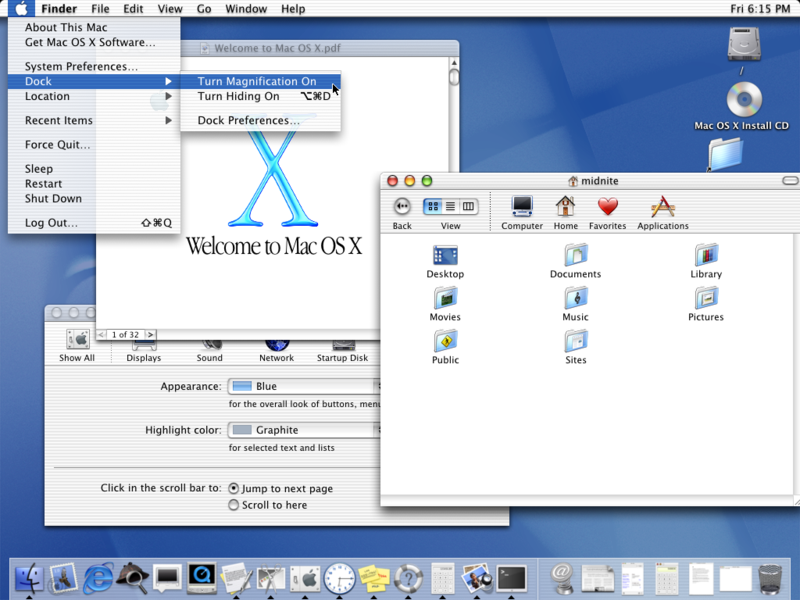 Mac OS developed a light grey UI with depth and cartoonish icons. Microsoft subsequently derailed cool things in technology with Windows, which introduced garish colors and a cheap looking, boringly grey UI. Once GPU compositing became possible around 2000, Mac OS X shifted to the new Aqua appearance with real translucency and bright colors, which helped the Mac UI stand out as much as brightly colored translucent plastics of the iMac and PowerMac G3. As this candy colored appearance grew old, Apple again shifted toward neutral greys and complex, photorealistic icons. iOS started out in 2007 with richly beveled photorealistic icons with gloss and sheen and reflections. By 2013, this had not only grown somewhat old fashioned looking, but would also be hard to maintain as iOS began making efforts to support resolution independence. The simpler, "buttonless" icons and light, color accented appearance of iOS 7 has remained fresh (and carried over to the Mac) since then. With the underlying technology of displays now getting ready to migrate to OLED, a new darker UI will not only look new and fresh, but will also help maximize the power saving potential of tomorrow's screens. Ten years ago, it looked increasingly like proprietary development platforms might be a thing of the past. Microsoft Windows had been increasing losing its monopolistic hold on desktop computing. Mozilla'a Firefox, Apple's Safari and Google's Chrome browsers were finally delivering a functional cross platform implementation of open web specifications, enabling the deployment of rich web applications across virtually any OS or hardware platform. Then iPhone appeared. Apple's first draft for third party applications imagined an open platform of mobile web apps anyone could build and host. But developers wanted more; they wanted the ability to build the same sort of sophisticated "desktop class" applications Apple had bundled on the iPhone, using native platform APIs. Apple conceded, offering a development platform and App Store based on its proprietary Cocoa Touch native APIs, essentially a mobile-optimized version of the Mac OS X Cocoa development frameworks (which themselves had originated from NeXTSTEP). Rather than being a mobile web app platform, iPhone OS introduced native apps that brought many of the sophisticated capabilities of conventional computing to mobile devices. The invisible hand of the market applauded. Cocoa Touch immediately became a popular and important platform, and quickly outpaced the Mac itself. Today there are about 100 million Macs in use, but somewhere around 750 million iPhones and 150 million iPads for developers to target with their native iOS apps. Over the last decade, every other mobile development platform began to fall out of mainstream relevance: Adobe Flash-enhanced web apps, Java Applets, Palm's webOS web apps, HTML5 web apps and Microsoft's Silverlight mobile web apps and then Windows Universal apps have all failed to matter as Apple's proprietary app platform took over the mobile space with a massive commercial lead. Despite its volumes of devices, Android's lower tier of commercial success as a development platform is also tied to an apps-centric model it copied from iOS. Google's real plans for the future of software imagined a thin client running web apps tied to Google's core competency in the cloud, but Chrome OS failed to achieve what it set out to do. Seven years after it was first laid out, Chrome OS hasn't gone anywhere apart from being dumped upon U.S. schools as a very low cost, easy to administer netbook. Neither consumers nor the enterprise wants Google's web-fist model. They keep buying or building their own native apps instead. Today, while Apple continues to develop its implementation of the mobile web browser with Safari, it has focused its attention on native Cocoa Touch apps on iOS. At the same time, Apple has been pursuing an iCloud.com initiative that has ported its iWork productivity apps (including Pages, Keynote and Numbers) from OS X and iOS to the web. 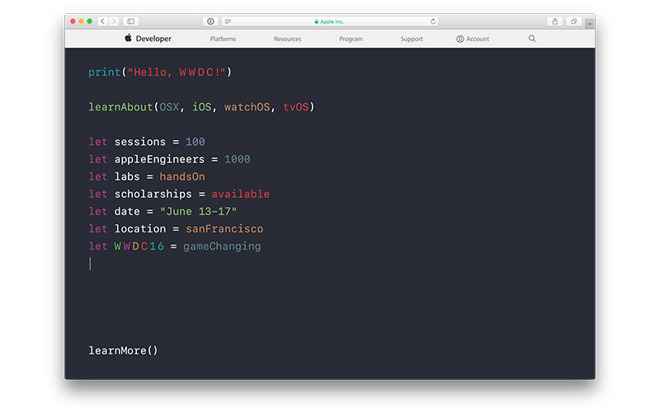 At WWDC, Apple is likely to open up its own insight into porting Mac and iOS apps into web apps, offering third party developers the ability to build sophisticated Cocoa framework web apps within Xcode for deployment through iCloud. Along with web app development frameworks, Apple is likely to port two other iOS concepts to the web: Apple Pay and Maps. Apple Pay might remain predicated upon Touch ID on an iOS device to authorize purchases, with a web user's iPhone essentially acting as a second factor authenticator. Apple Maps, on the other hand, is likely to bust out independently as an open service for third party web developers to tap into. The more users Apple can attract to its Maps platform, the better the data it will be getting back from all of its mapping clients. Apple already has its own Maps service working on the web, ranging from the Find My Friends or Find My iPhone apps on iCloud.com to browsable Maps embedded on retail Apple Store pages within the company's corporate website. 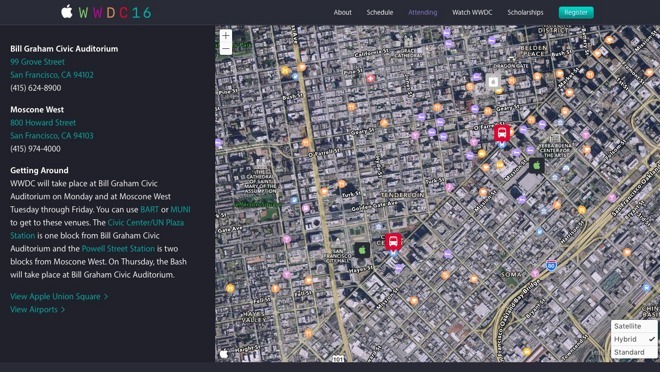 It even included an Apple Maps web view in its WWDC site to point out to the events two locations (above). There's more Apple needs to do to build out Maps, but having its service available from the web would make it easier to deploy tools that allow government agencies, cities, transit agencies, malls and national parks to update and maintain custom, detailed indoor maps and places of interest that all Map users would benefit from. Apple should also add more official app links to Maps, including apps related to popular attractions, cultural and historic sites and transit agencies, including those Apple hasn't yet built into its own Transit Maps layer. For iPhone users, Apple last year introduced a new Low Power Mode in iOS 9 designed to scale down computational power and background operations to extend battery life. Activating Low Power Mode optimizes a variety of system settings to keep your phone working for as long as possible. Apple Watch needs the opposite: a "liberal power mode" that loosens up its conservative power profile that currently makes the device feel slow and not very capable. If you wear Apple Watch just as a stylish timepiece, the device generally ends the day with some reserve power. But do some heavy work--particularly tracking workouts continuously where the heart monitor is running regularly--and you can run down your battery in as little as five hours. If Apple were to deliver a less miserly alternative setting, users would know they have to plug in their Apple Watch twice a day (say, for an extra hour of charging at noon). 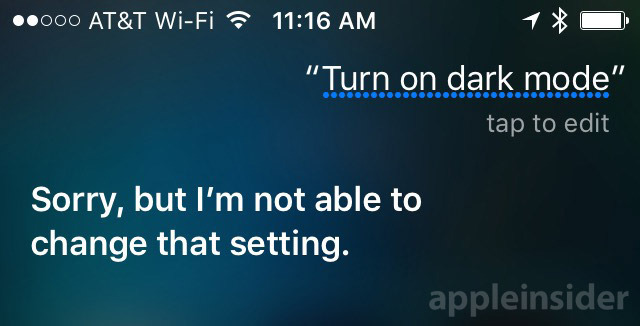 I'd happily trade off the inconvenience of knowing I need to bring my charger for knowing that my watch is going to respond very rapidly, launch apps fast enough to actually use them, keep the watch face lit long enough to see the results of the request I made, and consistently catch all of my Hey Siri requests. And as long as I'm wishing, I'd also like to see the Apple Watch charging disk offered as a separate accessory rather than permanently attached into a long USB cable. With just a disk and a Lightning cable, I could carry just one cable and use the induction charging disk anywhere I needed it. Carrying a cable just for the watch is a hassle when traveling, and its just not very convenient in general. It's also rather delicate, and if you stress the cable too often, you'll need a replacement. Apple is still working on its overall strategy for Apple Music, evaluating how much it needs to hold on to the legacy of iTunes and how simple the new Music app should be. The results should be unveiled this year at WWDC. However, the next logical step is for Apple to move from audio to video content. A new Apple Film app (or perhaps Apple Video, as Apple TV is already taken in a hardware device) could present iOS users with access to the same kind of content they can now stream on Apple TV, as well as present Podcasts and content from iTunes U.
Apple should also work to integrate its iBooks Author tool designed to create dynamic educational materials for iPads with its video editing tools and its TVML authoring tools designed to create easy to stream videos to Apple TV users. Further, the vast library of content now in iTunes U could provide another key killer app for using Apple TV in education. Apple should create some original video programming of its own, starting with how to develop with Xcode. Tim Cook said all children should learn how to program, and he now has a way to deliver that. 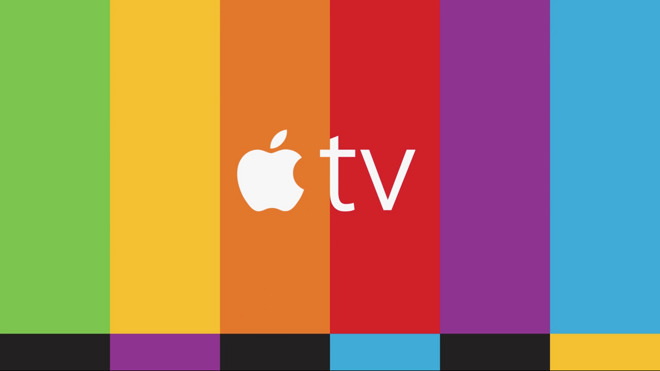 An Apple Film app and channel providing original content related to development, design and Apple technologies would make WWDC a year round event for anyone wanting to learn how to build their own apps for iOS, Macs, Apple Watch and Apple TV. This would also give Apple a foundation for jumping into other proprietary video content, along with the ability to launch an Apple Music-style licensed film archives of movies and educational videos. Last year Apple introduced the capability to filter out content in Safari. The most obvious application of this was for developers to deliver adblocks for iOS users, something that is already widespread and commonplace on Windows and Android. The previously inability of iOS users to easily block ads has helped to make iOS one of the most attractive demographics for advertisers to target, in addition to iOS users being statistically wealthier, better educated and more likely to buy things. Publishers are increasingly worried about the impact of adblock to cut into their advertising revenue. Apple doesn't want to crap on advertisers. But after iAd was viciously demonized, ridiculed & rejected by the ad industry, it appears Apple has less love for online marketers and much less interest in catering to them. Further, Apple knows that any efforts it makes to filter sophisticated, surveillance-based ad tracking (cookies and other cross-site tracking mechanisms) will directly hurt Google, Facebook and other potential rivals. After moving away from display advertising, however, Apple has introduced new plans for paid placement search in the App Store. Apple could turn things around by broadly encouraging content producers to shift from surveillance-based display advertising to app-based advertising, promoting consumption of apps--and paying publishers an affiliate commission on app sales they spark--in a model similar to Amazon, which pays similar commissions on product sales others recommend to their audience. Apple already has affiliate link programs for iTunes, Apps and other content, but by expanding this to serve as a meaningful revenue source for online publishers, it can muscle into Google's ad monopoly even as it puts pressure on display advertising by blocking the ability of ad networks to slow down websites and hog data connections in attempts to collect and link together as much data as it can on every user on the internet. A long time ago I suggested Apple should build a retail store client into the Mac Finder for ordering things like software, consumables (like printer ink) and upgrades (such as RAM). Imagine if every Mac and iPad came with a storefront that accepted orders for everything from apps to new hardware to accessories and even third party products, charged to Apple Pay and then fulfilled by retail partners. Apple has developed a pretty good online retail store. Why isn't it a prominently placed app integrated into the Mac computing experience, and available from the billion iPhones, iPads and Apple TVs the company already has installed? That's a question for Angela Ahrendts. Tomorrow we might get some answers.